• Dr. Gilmore has been reappointed Clinical Associate Professor, Department of Otolaryngology - Head and Neck Surgery, University of Texas Southwestern Medical Center, Dallas, Texas for the 2004 - 2005 year. Jim Gilmore, MD, President of the American Academy of Cosmetic Surgery will represent the Academy at the AMA Nathan Davis Awards in Washington, DC on Tuesday, March 14th. This program for the recognition of significant achievements was inaugurated in 1989 by the American Medical Association. The 2006 Dr. Nathan Davis Awards for Outstanding Government Service Awards, entering their 18th year of presentation, are recognized nationally as one of the most prestigious honors extended to elected officials and career government employees for outstanding endeavors that advance public health. Through these Awards, named for the founder of the AMA, they strive to encourage and stimulate public recognition for the significant accomplishments attained by men and women who are giving of themselves to advance the wellbeing of all. The AMA presents these Awards in 7 categories of public service including local, state, and federal government. Each year, the caliber of nominees is a testament to the incredible initiatives being advanced by governmental and elected officials throughout our Nation. The Awards will be presented at a Gala Banquet at the Renaissance Mayflower Hotel in Washington, DC on Tuesday March 14, 2006 in conjunction with the National Advocacy Conference. 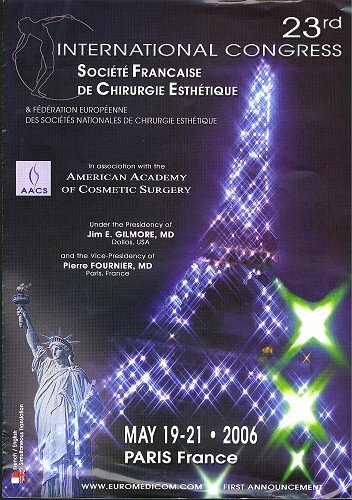 The 23rd Congress of the French Society of Aesthetic Surgery will bring together members of the American Academy of Cosmetic Surgery, colleagues from Europe and all over the world. Under the Presidency of Jim E. Gilmore and the Vice-Presidency of Pierre Fournier, the Scientific Committee has gathered many leading international high quality speakers. As in past meetings, we endeavor to diversify our presentations while allowing for creativity. We will remain vigilant when offering and performing innovative techniques on our patients. The scientific program promises to be fascinating. I and my colleagues from the French Society of Aesthetic Surgery and those from the American Academy of Cosmetic Surgery look forward to meeting you. Please join us! Chicago (January 25, 2006) - Jim E. Gilmore, MD of Dallas, Texas has been named President of the American Academy of Cosmetic Surgery for the 2006 term. Dr. Gilmore served as Chair of the Academys 2006 Annual Scientific Meeting, January 26-29, 2006 in Orlando, Florida. Dr. Gilmore is board-certified in three specialties, which include the American Board of Otolaryngology, the American Board of Cosmetic Surgery and the American Board of Facial Plastic and Reconstructive Surgery. He received his undergraduate education from Stephen F. Austin University and his medical degree from the University of Texas Southwestern Medical School at Dallas. Following graduation, Dr. Gilmore completed residencies in Otolaryngology at Parkland Memorial Hospital and the University of Texas Southwestern Medical School at Dallas. Dr. Gilmore also served as a Captain in the Medical Corps of the United States Air Force during the Vietnam conflict. With over 25 years of experience in cosmetic surgery, Dr. Gilmore is one of the finest cosmetic surgeons in the nation. A regular presenter at American Academy of cosmetic surgery scientific programs, Dr. Gilmore also serves as an Associate Professor in the Department of Otolaryngology at the University of Texas Southwestern Medical School at Dallas. In addition to these commitments, Dr. Gilmore is also a member of the Board of Directors for the Cosmetic Surgery Foundation. Additionally, he is affiliated with numerous organizations including the American College of Surgeons, the American Academy of Facial Plastic and Reconstructive Surgery, the American Academy of Otolaryngology/Head and Neck Surgery, the American Medical Association and the Texas Medical Association. Dr. Gilmore currently maintains his private practice, The Gilmore Centre for Cosmetic Excellence, specializing in cosmetic/facial plastic surgery in Dallas, Texas. For more information regarding Dr. Gilmore, or to schedule an interview opportunity, please contact the American Academy of Cosmetic Surgery at (312) 981-6769. I am just coming back to Munich after a trip and am clearing up my desk. I wanted to tell you that it was indeed a great pleasure having met you and your lovely wife in Frankfurt and how much I enjoyed working with you. I felt very privileged that I had the honour to assist you with the Advanta implants. I learned quite a lot from you. Thank you and I hope that we will meet soon again. IRVINE, Calif., November 30, 2004 - Allergan, Inc. (NYSE: AGN) continues to work with the appropriate state and federal public health authorities to investigate the isolated incident concerning patients treated with unknown substances at one specific facility, Advanced Integrated Medical Center, in Fort Lauderdale, Florida. The authorities have not yet determined if these patients are suffering from botulism and if BOTOX® (botulinum toxin type A) was administered to these patients. Authorities involved in the investigation have not indicated that lots of BOTOX® or BOTOX® Cosmetic are the focus of their investigation. Rather, the investigation is directed to inappropriate and unlicensed practices at the facility. In addition, Allergan has completed an exhaustive review of its manufacturing and safety processes and, based upon the companys investigation, the company is confident in the worldwide safety and manufacturing quality of BOTOX® and BOTOX® Cosmetic. Physicians and patients should continue to feel confident in administering and using BOTOX® and BOTOX® Cosmetic. Multiple agencies are involved in a potential criminal investigation at the Advanced Integrated Medical Center where the patients received unspecified treatments. Unidentified and unlabeled substances were reportedly discovered at the medical center and the patients may have been given a cocktail of unknown compounds intravenously. BOTOX® is a medical product containing tiny amounts (only a few billionths of a gram) of the highly purified botulinum toxin protein refined from the bacterium, Clostridium botulinum. BOTOX® has been approved by regulatory authorities in more than 70 countries for 20 different indications. Over the last 15 years, BOTOX® has been used to treat millions of patients worldwide who suffer from a variety of medical conditions. The same product was approved as BOTOX® Cosmetic in 2002 in the United States. Allergan encourages physicians and consumers with questions to call 1-800-433-8871 to speak to a company representative. Allergan also encourages both physicians and consumers to visit its web sites at www.allergan.com, www.botox.com and www.botoxcosmetic.com to learn more about BOTOX® and BOTOX® Cosmetic. Consumers seeking a qualified injector for cosmetic applications can find a trained physician on www.BOTOXCosmetic.com. About Allergan, Inc. - Allergan, Inc., with headquarters in Irvine, California, is a technology-driven, global health care company providing specialty pharmaceutical products worldwide. Allergan develops and commercializes products in the eye care, neuromodulator, skin care and other specialty markets that deliver value to its customers, satisfy unmet medical needs, and improve patients' lives. Irvine, Calif., November 29, 2004 - Responding to reports mentioning BOTOX® in relation to a facility in Florida, Allergan, Inc. (NYSE: AGN) reported today that it is currently working with the appropriate state and federal public health authorities to investigate the matter. This isolated incident concerns patients treated with an unknown substance at one facility, Advanced Integrated Medical Center, in Fort Lauderdale, Florida. There are many facts that remain unknown, including which product or products have been used in these cases. Contrary to certain reports, authorities involved in the investigation notified Allergan today that they cannot confirm that BOTOX® was administered to these patients. Allergan is diligently investigating this matter to determine what substance may have been used by the facility. Allergan has confirmed that in all of 2004, only two vials of BOTOX® were shipped to Advanced Integrated Medical Center and only one of which was shipped within the last 6 months. Allergan has reviewed all manufacturing and quality assurance processes involved with the vials and no deficiencies or irregularities were found. 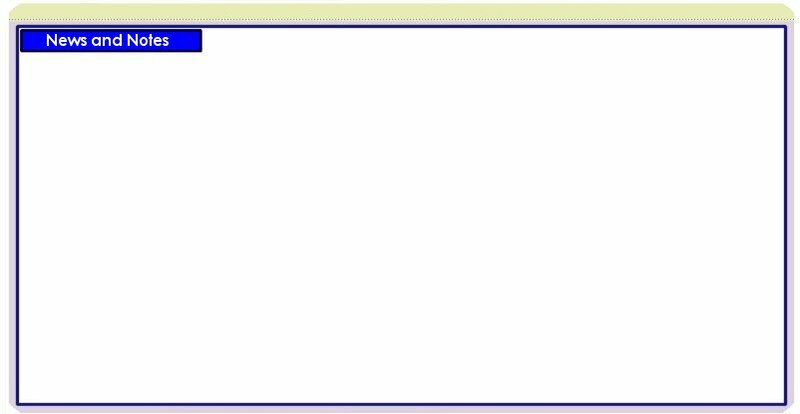 In addition, Allergan has reviewed all safety surveillance reports and found no medical adverse events from the manufacturing lots from which these two vials originated. Based on the company's investigation to date, we are confident in the worldwide safety and manufacturing quality of BOTOX® and BOTOX® Cosmetic. BOTOX® is a medical product containing tiny amounts (only a few billionths of a gram) of the highly purified botulinum toxin protein refined from the bacterium, Clostridium botulinum. It is one of the most widely researched medicines in the world with 20 approved indications in more than 70 countries and has treated millions of patients worldwide. Its proven 15-year efficacy and safety profile, which is supported by placebo-controlled clinical trials involving more than 10,000 patients, as well as open-label studies and extensive clinical practice involving millions of patients, demonstrates the benefits of this unique and versatile therapy. Allergan encourages physicians and consumers with questions to call 1-800-890-4345 to speak to a company representative. Allergan also encourages both physicians and consumers to visit its web sites at www.Allergan.com, www.botox.com and www.botoxcosmetic.com to learn more about BOTOX® and BOTOX® Cosmetic. Dallas, TX; October 28, 2004 - Facial Plastic and Cosmetic Surgeon Dr. Jim Gilmore will demonstrate his Advanced Facial J-Lift/Internal Face-Lift (IFL) techniques at the 7th International Darmstadt Live Symposium for Dermatologic Surgery, Cosmetic and Plastic Surgery in cooperation with the 27th Annual Meeting of the German Society for Dermatologic Surgery and Oncology (VOD), "Less is More New Concepts and Minimally Invasive Procedures" at the Congress Center Messe in Frankfurt, Germany, October 29, 2004. Dr. Gilmore has had tremendous success with his Advanced Facial J-Lift/Internal Face-Lift (IFL) combination, which addresses the three-dimensional proportions of the face. This concept of facial rejuvenation is based on analysis of the aging face or genetic defects, evaluation which begins with the consultation and careful mapping of the facial structures and neck allowing for a regional approach to the face. Restoring the youthful triangle of the face is the basic building block of this approach. The application of the final and significant phase utilizes the Advanced Facial J-Lift or jowl/jawline correction. Stellar results are met when artistic and exactness of details are presented. "Painting a Picture of Beauty" with reduced time of surgery without serious concern for prolonged anesthesia, surgery and recovery. This approach offers an improvement over the former techniques because incisions are hidden, employing maximum scar camouflage. The quest for youthful beauty can now be achieved without a "radical" or "over-done" face-lift. In addition to the Advance Facial J-Lift/Internal Face-Lift (IFL) combination, Dr. Gilmore will also lecture on "Preventing Complications in Face-Lift Surgery" (Komplikationen und deren behandlung // Complications and their trouble shooting). The goal of the meeting is to make dermatologic, cosmetic and plastic surgery intelligible and comprehensible in order to keep and improve the quality of skin, vein and plastic surgery. Attendants include the German Society of Dermatology (DDG), the International Society for Dermatologic Surgery (ISDS), and the American Academy of Cosmetic Surgery (AACS), as well as the European Society for Lasers in Dermatology (ESLD). Together this international, interdisciplinary exchange hopes to contribute to a better and honest patient care. Live demonstrations and intensive workshops will create a steady evolution of new techniques, which will be critically discussed by experts from all over the world. About Jim E. Gilmore, M.D. - Dr. Jim Gilmore, a nationally and internationally recognized facial plastic and cosmetic surgeon, founded his practice in Dallas, Texas twenty-five years ago. He is triple board certified by the American Board of Cosmetic Surgery, the American Board of Facial Plastic and Reconstructive Surgery, and the American Board of Otolaryngology (head and neck surgery). Dr. Gilmore and his organization at Gilmore Centre of Cosmetic Excellence are committed to patient advocacy and are in constant pursuit of excellence by introducing innovative new technologies in the field of cosmetic and plastic surgery. Visit their Web site www.JimGilmore.com for additional information or a tour of their AAAHC accredited, on-site, state-of-the-art outpatient surgical facility or call 800-637-0144. Dallas, TX; February 2, 2004 - Dr. Jim Gilmore will be traveling to Normandy for D-Day with Dr.Eugene Ellsworth, a surviving member of the 29th USA division that stormed Omaha Beach and Utah beaches on June 6, 1944. Dr. Ellsworth, who is 93, is expected to be the oldest of the D-Day survivors returning to the scene of the battle. They traveled to Paris on May 30 and will meet other surviving members of the US29th Division on June 2. The group will then travel to Normandy for a variety of events on and after June 6th to commemorate the 60th anniversary of D-Day. The 29th Division was the vanguard of the Allied attack, and stormed the Omaha and Utah Beaches in Normandy on D-Day. Dr. Ellsworth survived June 6th, the bloodiest day, during which 80% of his unit were injured or killed. This battle that was portrayed in the movie "Saving Private Ryan." Dr. Ellsworth was wounded three days later, but again survived. He went on to become, and still is, a teacher and composer of organ and piano music in Dallas. Several other local people are traveling with the group, including Astrid Harris, CEO of Polyglot-Network, and a language training firm, who is acting as a translator and guide for Dr. Ellsworth, and other members of the 29th Division. Dr. Gilmore is attending as Dr. Ellsworth's friend and as a "medical standby." Also attending are Gay Gilmore, RN and Mark Wassenich, a city planner and historian, who will assist in strategic planning. About Polyglot-Netork - Polyglot-Network is a language-training company that offers quick development of conversational skills in other languages. Instructors at Polyglot-Network are native speakers who lead the students to speak and think in the target language. They combine natural language, everyday situations, and extensive practice into their training program teaching the students to communicate fluently in another language. Dallas, TX; April 29, 2004 - Facial Plastic and Cosmetic Surgeon Dr. Jim Gilmore will demonstrate his advanced techniques for lip and facial augmentation using Advanta™ implants at the annual meeting of the Texas Cosmetic Surgical Society in Fredericksburg, Texas. Dr. Gilmore has had tremendous success with Advanta™, a groundbreaking new form of facial implant that is made from "ePTFE", a non-toxic, synthetic material. He uses the implants to create fuller, more youthful lips and to fill folds or wrinkles in the face. Unlike many implant materials, Advanta™ is permanent. "Often times patients don't want to return every few months for new filler injections. Advanta™ is an ideal implant material because it is permanent, soft, and natural-looking," said Dr. Gilmore. The Texas Cosmetic Surgical Society is a membership organization for cosmetic surgeons. The organization's goals include educating the public on new techniques and safety issues, and promoting a total treatment regimen for patients that includes exercise and proper diet along with the latest cosmetic surgery procedures. Dallas, TX; April 7, 2004 - Facial Plastic and Cosmetic Surgeon Dr. Jim Gilmore will perform live surgery to demonstrate his advanced techniques for lip and facial augmentation using Advanta™ implants. Dr. Gilmore's lecture and live surgery will be presented to members of the American Academy of Cosmetic Surgery (AACS) at the group's Facial Rejuvenation Live Surgery Workshop in Washington, D.C.
Dr. Gilmore has had tremendous success with Advanta™, a groundbreaking new form of facial implant that is made from "ePTFE", a non-toxic, synthetic material. He uses the implants to create fuller, more youthful lips and to fill folds or wrinkles in the face. Unlike many implant materials Advanta™ is permanent. "Often times patients don't want to return every few months for new filler injections. Advanta™ is an ideal implant material because it is permanent, soft and natural-looking," said Dr. Gilmore. Dr. Gilmore, of Gilmore Centre of Cosmetic Excellence in Dallas, will also present his Advanced Facial J-Lift and Internal Face Lift. The Advanced Facial J-Lift's name is derived from the area it corrects: the jaw line or "jowl". It is a dramatic improvement over former techniques because it is a progressive modification of the traditional Face-Lift that offers a more youthful appearance with quicker recovery and maximum scar camouflage. Dr. Gilmore's Internal Face-Lift (IFL) is a different approach to the traditional face-lift because it combines several minimal access procedures for improved, long lasting results. "As we address the effects of gravity, we must study the three-dimensional proportions of the face. By doing this we are able to see that the difference between a young face and an older face lies in the robustness of the underlying soft tissue and bone," said Dr. Gilmore. He restores this robustness during the first step of his Internal Face-Lift by remodeling and reconstructing the face internally using specialized implants, including the Gilmore Facial Implants, named for Dr. Gilmore because he redesigned them to create a more natural-looking result. These facial implants allow Dr. Gilmore to rebuild the face without stretching the skin, further enhancing the youthful appearance in the faces he rejuvenates. In addition to the Gilmore Facial Implants, Advanta™ implants complement the procedure by fine-tuning the overall results. The workshop will take place April 16-17 in Washington, D.C. The AACS regularly gathers physicians to explore new methods of treatment, tools and techniques that are changing cosmetic surgery. Dallas, TX; February 2, 2004 - There's more than one way to get fuller lips. While injectable fillers, such as the recently FDA-approved Restylane, or Collagen Replacement Therapy, are popular, some patients may prefer implants because they last longer and still feel soft and natural." Often times patients don't want to return every few months for new treatments", said Dr. Jim Gilmore, a facial plastic and cosmetic surgeon in Dallas, Texas. "Injectable fillers require a return trip because they are reabsorbed by the body. This is not true of implants. Once an implant is put into the body, it is there to stay unless surgically removed," added Dr. Gilmore, who is an internationally known expert in facial fillers and alloplastic implants for facial and lip rejuvenation. Dr. Gilmore is having tremendous success using the latest generation of facial implants, AdvantaTM implants (ePTFE). During Dr. Gilmore's two-year study he performed over 500 peer-reviewed procedures. Less than 1% experienced infection or asymmetry problems and none of the patients experienced a sensation loss. "We are extremely pleased with the results. The implants are flexible and soft, making them ideal for lip rejuvenation and reducing lines around the mouth. The patients report that the lips look and feel natural over time," said Dr. Gilmore, who expects the high demand to continue as more people hear about AdvantaTM implants as an option for youthful lip and mouth enhancement. Dr. Gilmore inserts the implants beneath the skin using a dissector that he designed (the Gilmore suction elevator produced by Byron Medical); a surgical tool that allows for scientific placement by creating a tunnel in which the implant is placed. This technique allows for accurate placement and provides a "no-touch" system during surgery, further reducing the risk of infection and resulting in tiny, inconspicuous incisions. Unlike injectable and absorbable fillers, AdvantaTM implants have a simple exit strategy. If complications occur or the patient is not pleased, the implant can be easily removed. "Many of our newest patients for AdvantaTM implants have been referred to us by previous patients, an indication of patient satisfaction," added Dr. Gilmore.